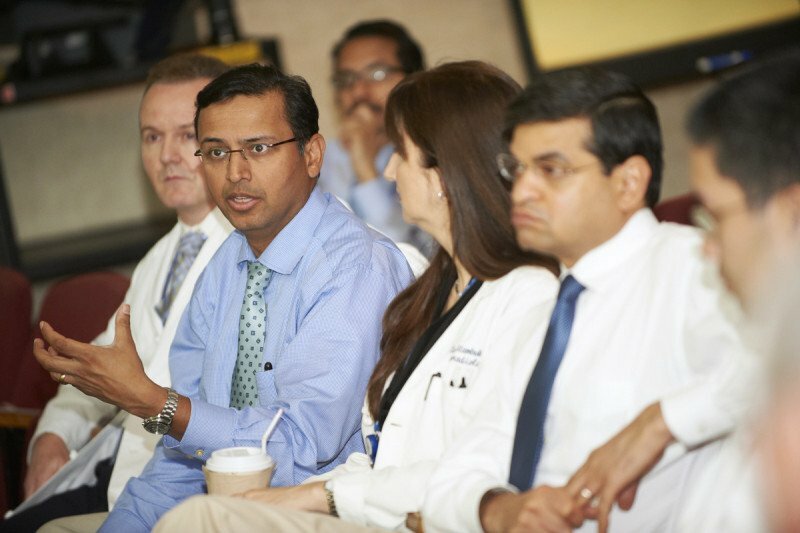 Surgeon Bhuvanesh Singh (center) presents a patient's case to surgeon Ian Ganly (left), diagnostic radiologist Hilda Stambuk (right), and other members of the Head and Neck Cancer Disease Management Team. Before you begin treatment, your care team will need to diagnose which type of head and neck cancer you have. This is a key first step in developing the best treatment plan for you. At Memorial Sloan Kettering, sophisticated pathology and imaging tests provide our care teams with a lot of information. The radiologists and pathologists who perform these tests focus on head and neck cancer. This training gives our team the expertise to ensure that you get the right diagnosis. We personalize your care as much as possible. Throughout the course of your treatment, we’ll continue to use some of these tests to track the size of the tumor and assess your response to treatment. Your doctor will thoroughly examine the head and neck area, feeling for abnormalities, looking inside the mouth and throat, and using mirrors and lights to examine hard-to-see areas. An experienced doctor may be able to detect problems that a less-experienced one might not observe. In some cases, your doctor may use an endoscope (a thin lighted tube with a camera at its tip). This tool is helpful in examining areas of the head and neck that are more difficult to reach. The tube may be inserted through the nose or mouth. A topical anesthetic (a medication applied directly to the nose and throat) can make the examination more comfortable for you. The exact name of the endoscopy procedure depends on where the tumor is located. For example, you may need a nasopharyngoscopy, pharyngoscopy, or laryngoscopy. Occasionally, a doctor will perform a more thorough type of endoscopic examination called a panendoscopy. This procedure requires general anesthesia. Your doctor may be able to make a diagnosis based on a needle aspiration of the tumor. However, many people need to have a surgical biopsy. During a biopsy, a surgeon removes a small amount of abnormal tissue from the area where the cancer is suspected. A pathologist then examines the sample under a microscope and works with the other members of the care team to make a diagnosis. At MSK, we have a team of pathologists whose sole focus is diagnosing cancer of the head and neck. This specialization allows us to make the most-precise diagnosis possible. A more-precise diagnosis can improve the effectiveness of your treatment or spare you from treatment that won’t work against the disease. Additional imaging tests may include a barium swallow (which helps show abnormalities in the esophagus), dental X-rays, chest X-rays, and radionuclide bone scanning (a sensitive method of measuring bone activity). These imaging tests provide more details about the tissue. If cancer is found, the scans can show how deep the cancer is and if it has spread. At MSK, our radiologists use the most-advanced imaging technologies to safely detect and monitor cancer. Our extensive knowledge of head and neck cancer allows us to choose the imaging approach that’s best for you and to define the precise extent of the tumor. At Memorial Sloan Kettering, human papillomavirus (HPV) testing is routine for many people with throat cancer. We use a variety of different testing options to help us classify a tumor. People with an HPV-positive throat cancer have a better prognosis than those with other forms of the disease. We may be able to offer you a less-intensive treatment plan that reduces your side effects without affecting your chances for a cure. Our doctors are experts at evaluating thyroid nodules to determine whether you have thyroid cancer. If so, they can determine the cancer’s risk level. We will offer treatment options to you based on whether your disease is low-risk or high-risk. We provide thyroid nodule assessment at multiple locations. For people in New Jersey we offer a specialized thyroid nodule assessment program at our Basking Ridge location. Genomic testing is also called tumor sequencing or molecular profiling. It involves looking at the cells taken from a tumor to see if there are any genetic mutations (changes in the genes) that could be linked to the type of cancer you have. For people with advanced head and neck cancer, our experts use a testing approach called MSK-IMPACT™. This test, developed by MSK experts, screens for mutations in more than 450 genes at once. Based on which mutations we find, we may be able to help you avoid treatments that won’t work for you. In some cases, we may be able to recommend a drug that has been approved for the specific changes in the tumor you have. Or you may be able to join a clinical trial testing a new approach, such as a targeted therapy or immunotherapy. Genetic information about the tumor can help us predict the chances that the cancer will return after treatment. Almost all of these genetic changes are found only in cancer cells, not in normal cells, which means they cannot be passed on to your children.